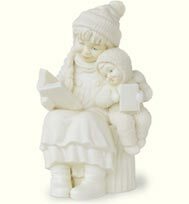 bisque figurines began in 1986 when the first model was introduced by Department 56. Ten years later in 1997 the Snowbabies Friendship Club™was launched. Department 56 itself was founded in 1976 and In 2005 after purchasing Lenox from Brown-Forman, the company changed their name to Lenox Group. It is most famous for its lighted porcelain houses. three-dimensional prototype to the exact specifications of her artwork.